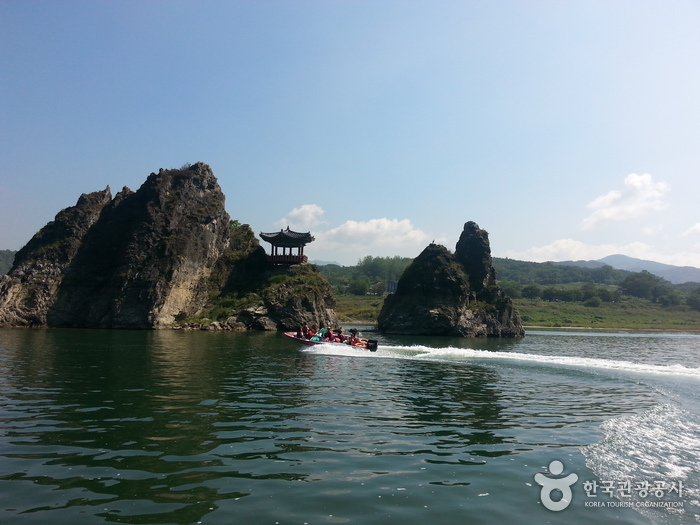 Dodamsambong are three stone peaks rising out of the Namhangang River. The big rock is called Janggunbong (Husband Rock), the rock on the left side which appears to be showing coquetry is called Cheopbong (Mistress Rock), and the rock on the right side which is turning away from the big rock is called Cheobong (Wife Rock). The peaks are said to represent an angry wife turning away from her husband who has taken a concubine in order to secure a male heir. It is said that Jeong Do-jeon, a politician who made contributions to the establishment of the Joseon Dynasty, spent his young days here and used ‘Sambong’ as his pen name. Surrounding the three peaks is a musical fountain which was set up in 1998. The fountain becomes a place for tourists to relax, especially during the nighttime, when watching the water cascade and flow in time with the music is a thing of beauty.